Enjoy the Winter White in Cadillac! Here we have outlined a complete weekend in Cadillac filled with lodging, dining shopping and of course, exploring our outdoor winter wonderland. We have taken the guess work out of your weekend, and have outlined a complete weekend where your family of four will be able to enjoy all of our area’s top attractions for UNDER $500! We hope you enjoy your trip with us to Cadillac, Michigan! Pick a Place to Stay: Cadillac isn’t just a summertime destination. Winter is packed with many budget-friendly activities that can get you out into Mother Nature, stretching your legs and enjoying the winter white. First off, accommodations are a must. Winter brings great daily lodging rates and you can expect to pay around $93.00/night on average, and there are even rooms starting at $59/night. With taxes, you will be right around $205 for your 2 nights in Cadillac. Not too shabby! Photo: Stay in the Lodge at Caberfae Peaks – with heated outdoor pool and spa! Dine Downtown: Make your way downtown for some local flavor and try one of the top-rated dining spots in the area. When you are finished, take in some of the local boutiques and shops – Search all of the dining options downtown and in the Cadillac Area. Enjoy a Morning Skate at the Wex: When was the last time you tied on a pair of skates and glided gracefully across the ice? This indoor skating arena permits open ice rink access on the weekends, admission includes free skate rental. 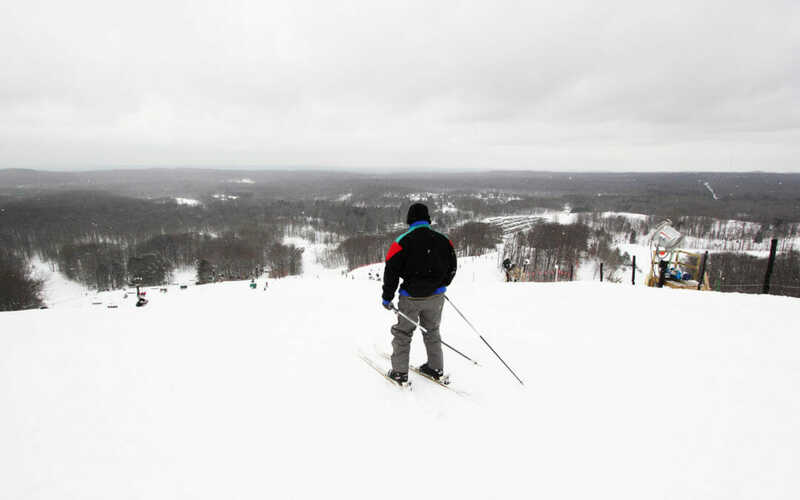 For the Downhill Skiing Family: Skiing at Caberfae Peaksintroduces you to the largest vertical drop in the Lower Peninsula (at 500’) and also one of the best downhill skiing values you will ever find. You can enjoy an entire afternoon on the slopes, with grab-and-go food options on site, you can maximize your time on the powder. In addition, the awesome night skiing along with the new Backcountry ski area (open for the 2017 season) will make this one of the best ski experiences, dollar for dollar, over anywhere else in the State of Michigan. For those looking for a great deal, check out the Family Fun-Day Sunday for cheap lift tickets, rentals & even a lesson! MAKE SURE to book early online for the best rates. For the XC Skiing Family: Our cross-country ski trails offer a scenic tour of Cadillac’s winter wonderland. Make your way to Evergreen Resort or Coyote Crossing Resort for your equipment rental if you don’t already own, and take to their trail systems. You can also make your way out to the Cadillac Pathway, Big-M Recreation Area, or the MacKenzie Trail at Caberfae Peaks to explore their groomed offerings (some areas have no parking fee). Enjoy a morning exploring the Carl T. Johnson Hunting and Fishing Center As the sun rises, find yourself at the Carl T. Johnson Hunting and Fishing Center in Mitchell State Park. Here you can snowshoe the trail system or try your hand at ice fishing. The best part… equipment rentals are free! Just call ahead to reserve (231) 779-1321 and you can try your hand at either of these great winter sports before making your way back home after your 2-day winter escape in Cadillac. Pick up your Cadillac gear and head for home… After spending the morning exploring the historic district, shop our local boutique shops downtown, pick out that perfect souvenir to remind you of your weekend away and get ready to head back. Browse our area shopping. We hope you see the great value that the Cadillac Area offers, and that we are your top choice for a winter destination this season! We also welcome you to request your FREE travel guide. Click here and we will mail a copy right to your door. This all new 2017 guide has everything you need to know for traveling to Cadillac in any season. Explore your Way!